Finally! Google Pay has finally arrived in Germany! It has taken much longer than most expected but the tap-to-pay app can now be used with four different banks for Germans. Rumors had been floating for several weeks that Pay’s debut in Germany was going to happen but there was nothing official on it. Now the Google Pay support page for Germany has been updated reflecting support for the country. As for the banks supported, you have four available: Comdirect, Commerzbank, N26, and Wirecard. If you bank with one of these institutions in Germany, you can now add your cards to Pay to use them where ever terminals allow you to tap to pay. As for which cards from which institutions are supported or not supported, here is the list according to Google. 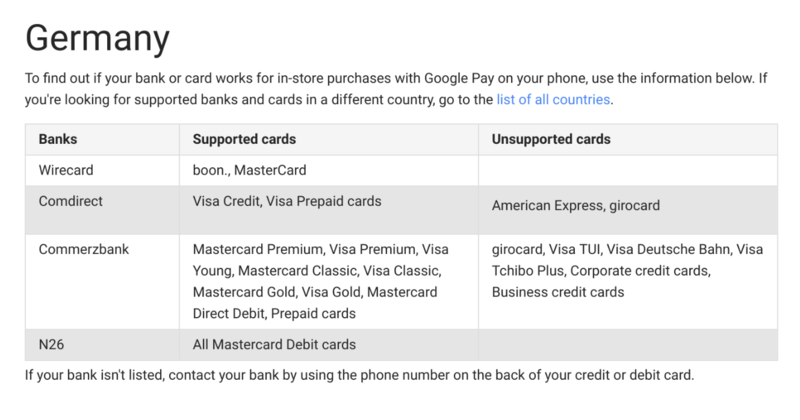 Assuming you have a supported card from one of these institutions, all you need to do is make sure you have the Google Pay app and then associate your card with the app. Then, when you go to a retailer that has tap terminals, you can use your unlocked phone to pay for goods and services (you don’t necessarily have to have the Pay app itself open). Google has become the first company to get their pay app into Germany. Both Apple Pay and Samsung Pay, the two other popular payment apps, are not available in Germany just yet. That will likely change soon now that Google has gotten past the regulatory requirements but for now, it is Google Pay only in the country.